Protect your Scoped Rifle…but still hide it with A-TACS Camo™. 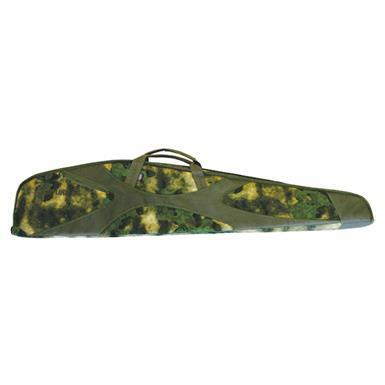 Birchwood Casey SportLockTM 48" Scoped Rifle Cases are constructed to provide superior protection for your firearm, while still remaining affordable. SportLockTM makes each case out of high-quality materials to provide the greatest security for your Rifle. Inside, a heavily padded, quilted liner keeps your firearm shielded from bumps and jostling. Heavy-duty zippers ensure reliability, while external zipper pockets are ideal for toting accessories. Outer Dimensions: 10.5" x 48" x 2"d.
Inner Dimensions: 10" x 47.5" x 1.5"d.
Exterior measures 9.5" x 36" x 4"d.
Interior measures 8" x 34" x 2"d.
Carry your rifle in refined style! Keep your favorite firearm safe!